The science (seebeck effect) behind Thermoelectric Generation is often referred to as, a phenomenon. We think TEGs are extraordinary and impressive for sure! They can also sometimes be confusing to understand and difficult to use. That’s why we put together this quick guide, to explain how TEGs convert heat to energy, what parts and components they’re made from, and how you can easily use one for practical alternative energy solutions. Whether you’re off-grid, live in a remote area or cold environment, there is probably an application for you where a TEG could be used to convert waste heat to electricity. 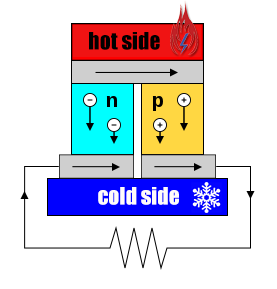 To start, a TEG, short for Thermoelectric Generator, is a device that converts temperature difference into electricity. I’ll explain exactly how it does this (seebeck effect) later. But first, let’s overview some common TEG terminology. Knowing these terms and their relationship to each other will help make TEGs easier to understand. At the heart of a TEG is the Thermoelectric Module (TEM), which we also call a TEG Module (Pictured to the right is a TEG Module from TEGpro). And, inside that TEG Module is where the magic (seebeck effect) happens. 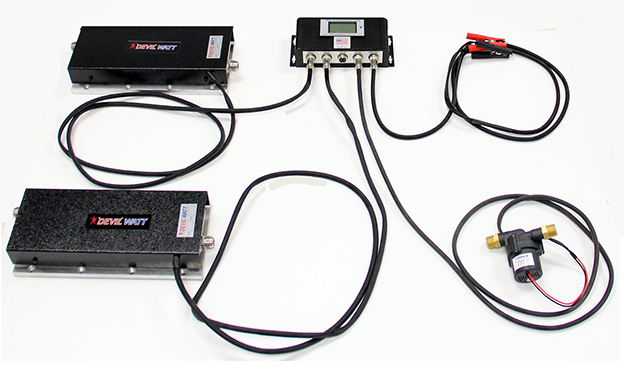 A TEG Generator is a device utilizing one or more TEG Modules as the primary components, followed by a cooling system. The cooling system can be either passive air, active air or hydronic. These components are then fabricated into an assembly to function as one unit called a Thermoelectric Generator (Pictured here is a Devil Watt TEG Generator with active air-cooling). Taking it a step further, a TEG system incorporates other hardware into a TEG, like water pumps, electronics and firmware. This helps prioritize power and keep the system cool. A good example of a TEG system is the TEGpro 100W TEG Water-Cooled System that will cycle water from a baseboard hot-water heating system through a water-cooled TEG. Thomas Johann Seebeck discovered that a temperature difference between two different metals produces a voltage difference. Take a few seconds to review the picture to the right, you’ll see two different electric conductors called: P-Type and N-type. What happens is the heated electrons flow towards the cooler ones (see the positive/negative arrows pointing down). And, when this pair is connected through an electrical circuit, direct current flows through that circuit. The Peltier Effect is the reverse phenomenon. 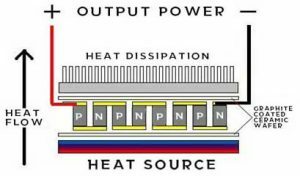 Instead of applying heat differential, electrical current is passed through the materials and as a result heating or cooling is produced. Our goal was to define these as simply as possible and provide the images to represent it, but if you want the Wikipedia definitions, those can be seen here. The voltages produced from the Seebeck Effect are small and depend on both the material used and temperature difference. However, inside a TEG Module there are multiple P-type and N-type pairs, that can be connected in-series to increase the output voltage or in-parallel to increase the current. In the image to the right you can see the P-type and N-Type materials connected in-series by the yellow lines. How Are Thermoelectric Generator Modules Made? Construction of a Teg Power Module consists of pairs of p-type and n-type semiconductor materials with a high thermoelectric coefficient. Although many alloys can be used, bismuth telluride is the most common material used today. This material is sliced into small blocks, one forms the p-type conductor and the other the n-type conductor. Each pair forms a thermoelectric couple (TEC). These thermocouples are most often connected electrically forming an array of multiple thermocouples (thermopile). Unlike solder used in the construction of TEC’s, thermoelectric generator modules often require solders that reflow well in excess of 400 C.
Most thermoelectric generator module manufacturing companies use many thermoelectric couples that are sandwiched between two pieces of non-electrically conductive materials. It is also necessary for this material to be thermally conductive to ensure a good heat transfer, usually two thin ceramic wafers are used, to form what is called a thermoelectric module. Each module can contain dozens of pairs of thermoelectric couples and be called thermoelectric generator modules, TEC modules and sometimes Peltier or, Seebeck modules, which simply denotes whether they are being used to generate electricity (Seebeck) or produce heat or cold (Peltier). Functionally there is no difference between the two. They both are capable of producing heat and cold or generating electricity, depending on whether heat is applied or an electrical current. There are however differences in performance between various modules depending on what they were manufactured for. For example, if a module is being manufactured for use in a 12 volt dc automotive cooler, the thermoelectric couples will be of a thicker gauge and so will the wire connecting the modules to the 12 volt dc power source. In most cases the module itself is quite large. This is because the module will be conducting a heavy load of current and will need to be able to handle the load. Although this type of module can be used to produce electricity they are not well suited for the task because they have a high internal resistance (lowering output) and lower temperature solder that may melt if used for Seebeck purposes. Meaning the electrical connection may fail when the higher heat needed to produce significant amounts of electricity is applied to the module. If a thermoelectric module is being manufactured for use in a thermoelectric generator it has its own unique requirements. First they need to have lowest internal resistance and high temperature solder comprising of silver for example, to connect the wires. Also PTFE or Fiberglass coated wire must be employed to handle the high temperatures. Silicone fiberglass sleeves can be slipped over the wires to provide more protection from the high temperatures. You may be surprised just how much! Even though a Wood Stove is not considered a waste heat source, below is an example of how much power you can generate. 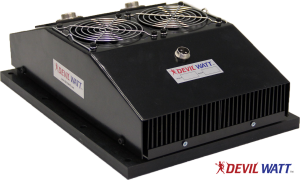 Being used is a 15 Watt Devil Watt Generator built with Tegpro thermoelectric modules. The output from this Thermoelectric Generator is up to 15-watts and the light is a 10-watt EverLed LVL2 flush mount fixture. 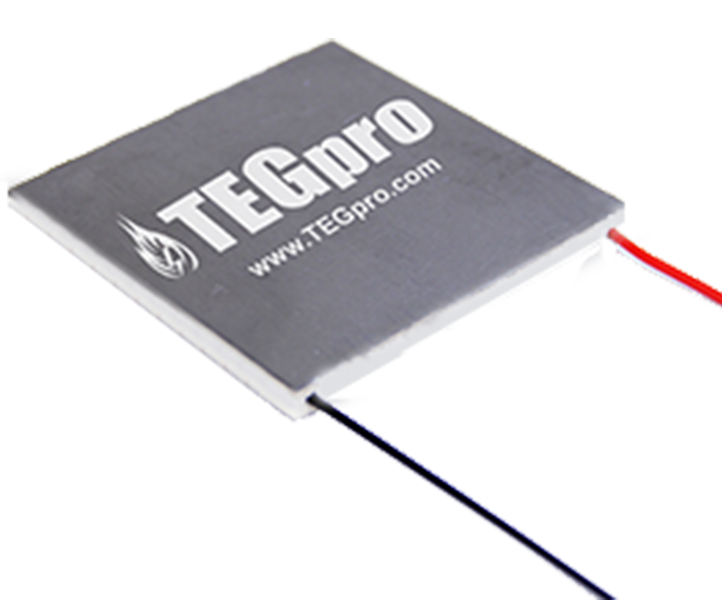 Tegpro has designed Thermoelectric Generators for Wood Stoves that have exceeded 200 Watts in Thermoelectric Power Generation! Electricity is a necessity. If you’ve ever had to suffer through an extended power outage, you’d know what it is like to loose all the food in your refrigerator. If you live in a cold climate your house was cold because you have no heat, as the majority of heating systems require power to run. Millions of folks have been in this position when a winter storm knocked out power over large areas. Solar panels are a great renewable energy source, but they only produce power in the daytime. Their daily output is significantly reduced during the shorter days in the winter months. Using TEG Power Generators in cold climates, in conjunction with solar, can provide all of your home’s energy needs. When you compare the costs of solar and thermoelectric generators living in the cold northern climate (based on the amount of electricity they actually produce per day) you’ll find that TEG Power Thermoelectric Generators cost far less per kWh than solar. The Photovoltaic equivalent of 100 watts of TEG power operating on a wood stove is 660 watts of solar panels or 2.4 kWh per day. This means that averaging 125-watts of thermoelectric power in a Vermont house can produce the same amount of electricity in a day as 1000-watts of solar PV panels. If comparing costs, the price range for 1000-watts of solar would be as much as $3,000 depending on the particular brand. Whereas the cost of 125-watts of thermoelectric power can be as low as $1,200. Unlike solar, TEGs aren’t dependent on the sun to produce power. If you have a continuous heat source, like a wood or pellets, TEGs can produce power 24 hours a day. Unlike fossil fuel generators, TEGs have few moving parts, other than cooling fans or water cooling pumps, and can be rated to last for more than 100,000 hours of continuous operation. This entry was posted in Guides & Tutorials on April 8, 2018 by Brooke Sault.